During the Byzantine period (spanning from approximately 300 C.E. until mid 15th century) a vast empire, with its center in Constantinople, spread across much of Europe and the Middle East. By the 4th century this eastern Roman Empire had adopted Christianity as the primary religion and was strongly influenced by the Middle-Eastern cultures. 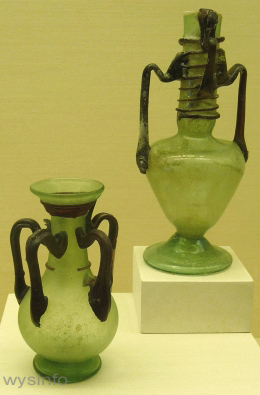 Reflecting the historical changes during this period, differences between the western Roman culture and eastern Roman culture are apparent in the different design styles applied to their respective perfume vessels. 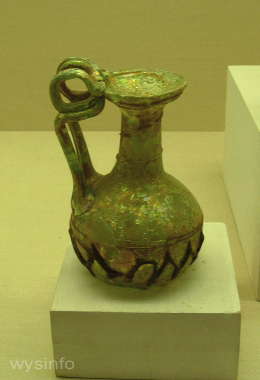 Toilette vessels which are typical of the Byzantine period have a heavier decorative pattern, often using many handles, coils and trails. A strong oriental (middle-eastern) influence is apparent in the designs. 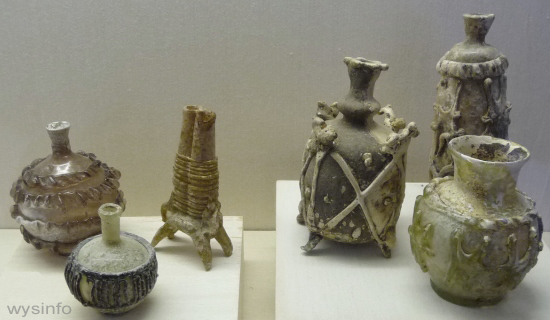 Remnants of perfume vessels from the Islamic culture are plentiful. They can be found all through the countries conquered by the Islamic armies – in particular Egypt, Syria, Iraq and Iran. 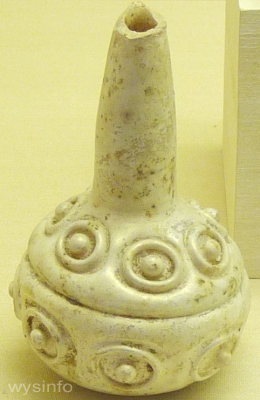 Early Islamic containers were often covered with indented crimped and wavy coils, disks and other types of applied decorations. Islamic designs included geometric patterns, depiction of plants and animals, texts in Arabic script and arabesque – a form of art that became prevalent in the Islamic world from approximately the 9th century and is still popular today. The arabesque designs involve the interweaving and scrolling of flowers or plants and usually present very complex yet balanced patterns. 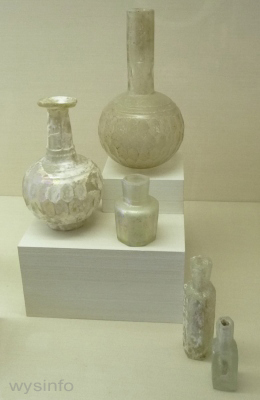 In addition to mastering the techniques used by the ancients, Islamic glass and bottle makers introduced new techniques in their designing. 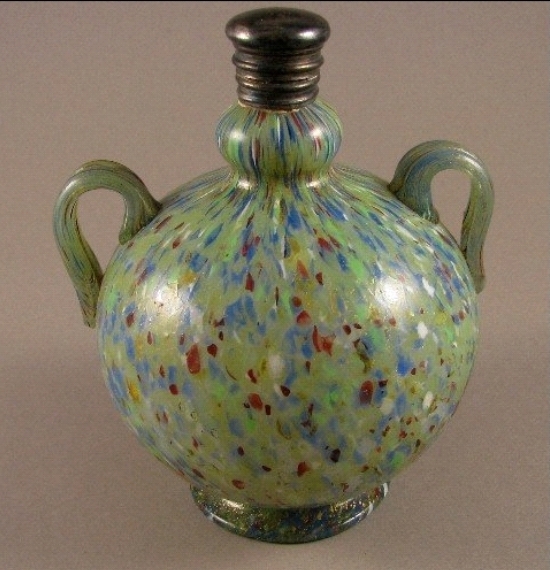 One can find bottles from this period that were painted with pigments of copper or silver, or both. Once they were placed in the fire, the vessels acquired an ultra-thin layer on the surface which added a metallic shine to the glass. Another design technique involved markings on the glass by an artist, and then the removal of the glass around the artist’s design, resulting in magnificent relief-cut friezes usually of plants, animals and inscriptions. Islamic glass design reached its peak during the 13th and 14th centuries C.E., but experienced a setback after the invasion of the Mongols into Syria. 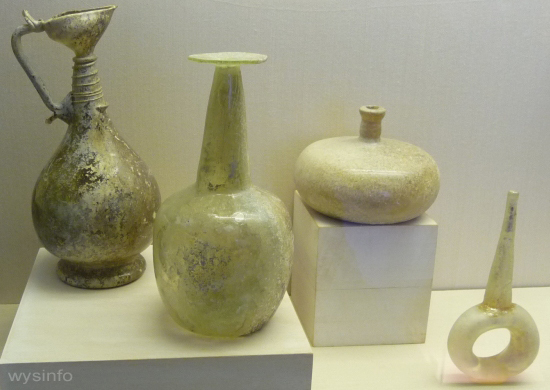 A number of glass making centers survived and continued during the Mamluk and Ottoman periods. There is still a traditional glass blowing factory in Hebron today. 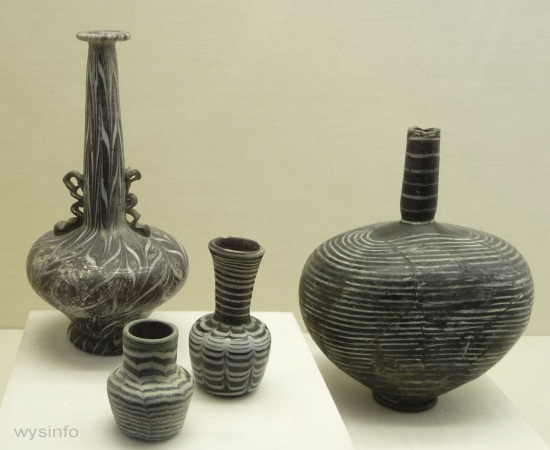 Since there was constant trade between the Phoenician/Middle Eastern coastline and the other side of the Mediterranean, it is no wonder that a glass industry was already well established near Venice as early as the 7th century C.E. 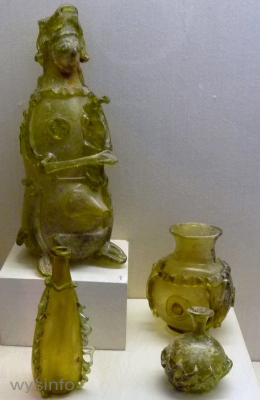 Some have argued that the glass industry of Venice did not emerge as a result of the Mesopotamian, Phoenician and Roman influence, but developed independently. However it is very likely that the earlier industries did play an important role, if not directly then as a result of the influence of Byzantine craftsmen who arrived in Venice after the fall of Constantinople. 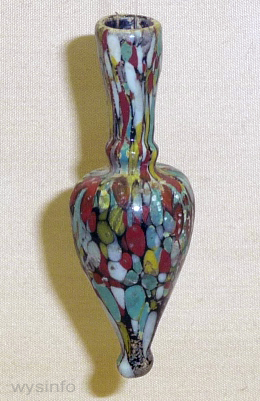 In 1291 the glass furnaces of Venice were moved to the neighboring island of Murano, and to this day Murano is known throughout the world for its unique glass work. 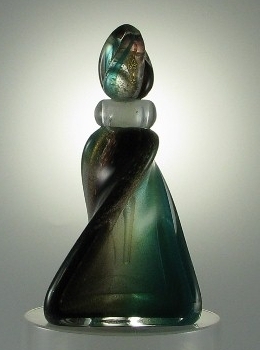 The magnificent glass of the Murano industries developed in close relation to perfume industries that flourished, during the Renaissance, in both Venice and Florence. Venice, as a great port, was affected by many cultures throughout the years. 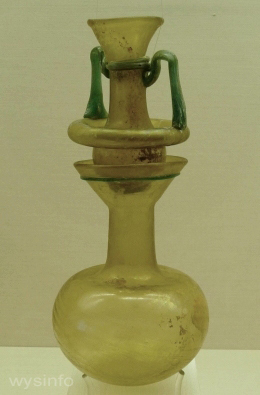 One can see the influence of Islam in some of the perfume containers that have been found from the early period of Venetian glass-making. 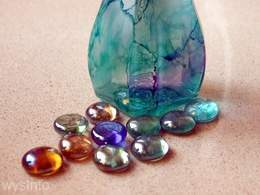 For example there were glass beads, called ‘Perfume Pearls’, that were pierced with small holes for the purpose of holding scented substance, and rosewater sprinklers which were designed in the Islamic style. Eventually the use of perfume spread from Venice and Florence throughout Europe. 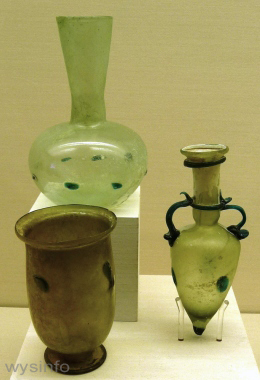 During this period perfume was often placed on or in objects other than bottles, vials or jugs. 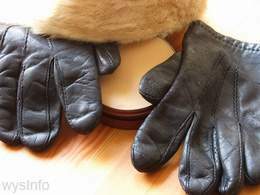 For example, around the 16th century, it was a common practice to add perfume to gloves in order to cover the strong smell of the leather. Pomanders (from the French pomme d’ambre, or apple of ambergris) were used as early as the Middle Ages (spanning the 5th century through to 15th century) and were worn to ward off evil spirits, disease and infection, as well as for combating unpleasant odors. 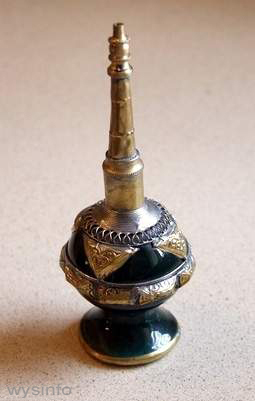 These were often small filigree or perforated balls or boxes of precious metal, filled with spices or other solid fragrant substances, and were worn around the neck or attached to the waist. One can still find examples of small jeweled boxes designed for a similar purpose, crafted by Yemenite Jewish jewelers, known as masters of a unique style of silver work which is considered one of the oldest filigree styles in the world. For generations Yemenite filigree knowledge, centered in the capital city of Sana, was passed from father to sons to grandsons. Today there are only a few Yemenite Jews left who can still claim expertise in this special craft. This Jewish tradition also includes the use of ornately designed spice or perfume boxes which were –and still are today– filled with aromatic spices and placed on the Sabbath table for use in the Havdala ceremony. These were usually designed in silver in the form of peaked or domed towers (often reminiscent of medieval towers) depending on the architectural influence of the culture that the Jews found themselves in. These ‘Shabbat perfume boxes’, filled with cloves and other fragrant spices, symbolize and celebrate the “Perfume of the Sabbath” and have been part of the Jewish tradition for hundreds of years.